No. 2, after Altered Life (Sam Dyke Investigations) of the same author. I had read the sample from this book and was interested by the conversation between father and newfound son, then realised it’s preceded by Altered Life so read that one first. I liked this one better than the first one. It’s not so suspenseful that you don’t know who the bad guys are. It’s not a whodunnit as much as a thriller. The suspense is in how he’s going to catch them. I like the writing, sometimes it’s funny, but the characters aren’t deep. I was hoping for more insight into the main character and his relationship with his girlfriend (who you’re not even sure will show up in book 2 from the ending of book 1) and his son who he’s never met. Not much effort in getting to know the dude he fathered eighteen years previously. I’m disappointed in the characters. The MC (main character) is not very likable most of the time, and there’s not a lot of human interaction or emotional investment from him. The thriller part of the story is well constructed though. A bit dry, very little humour, and another abrupt ending where you don’t know what’s going on with the people in the MC’s life. The bad guys are dealt with. That’s it. It’s a PG-13 book, just because it’s violent. 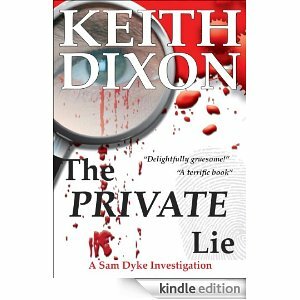 This entry was posted in Uncategorized and tagged book, Keith Dixon, mystery, series, The Private Lie, thriller by Phoebe Sean. Bookmark the permalink.